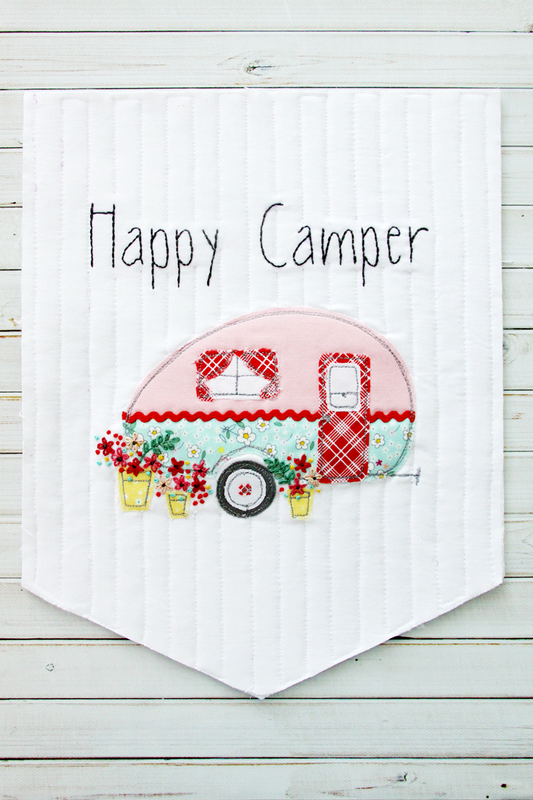 We’re a bunch of happy campers since Bev McCullough joined us for a Live Video on May 29 to show us how to create the darling “Happy Camper” mini quilted banner that is sure to add a touch of charm to any glamper or sewing studio! Learn more about Bev on her blog, Flamingo Toes and follow along on Instagram! Watch the replay of the Live Video below, and keep scrolling for step by step instructions! 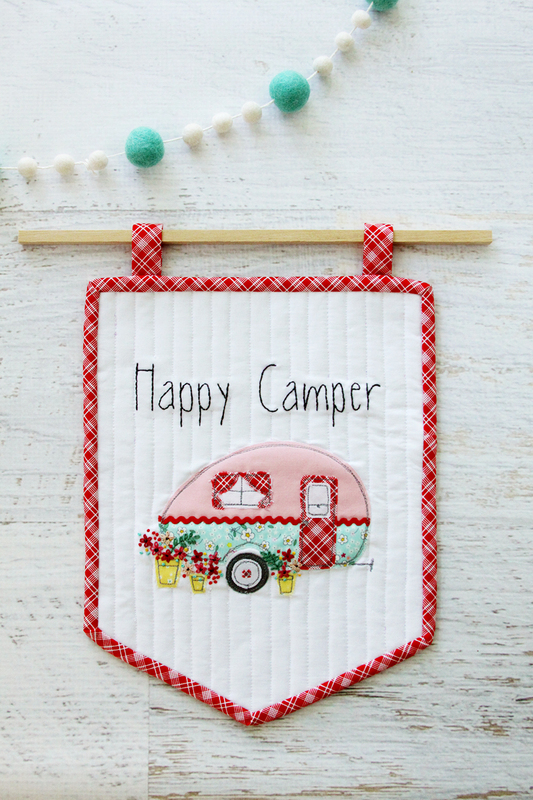 Read on to see more photos of this fun project, and be sure to download the FREE Colorful Camper Banner Mini Quilt Pattern from Flamingo Toes HERE! 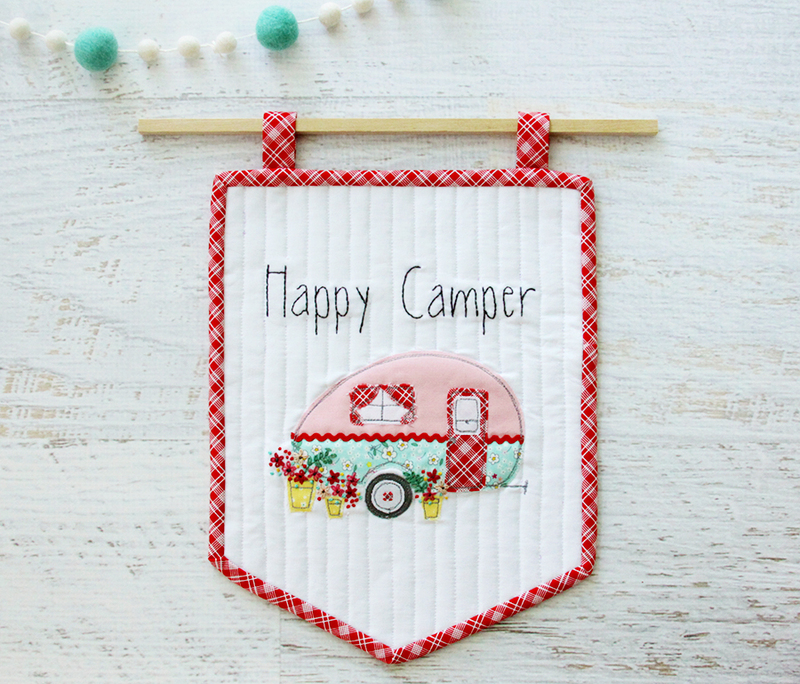 Show off your sense of adventure with this Colorful Camper Mini Quilt Banner! 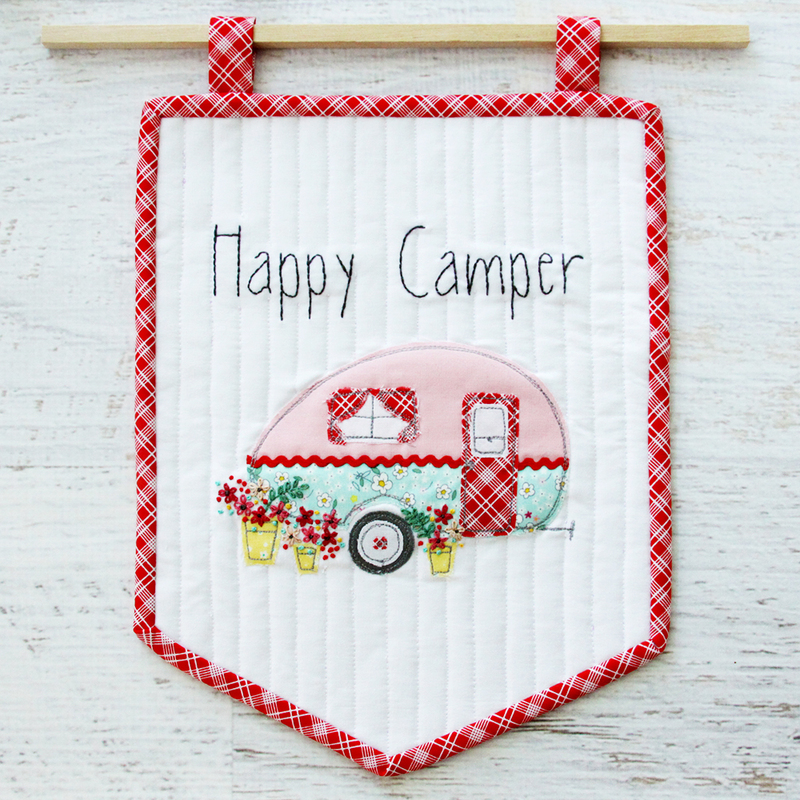 It is so quick to sew and it is a perfect scrap-busting project – you can mix and match your favorite prints to create this cute little camper! 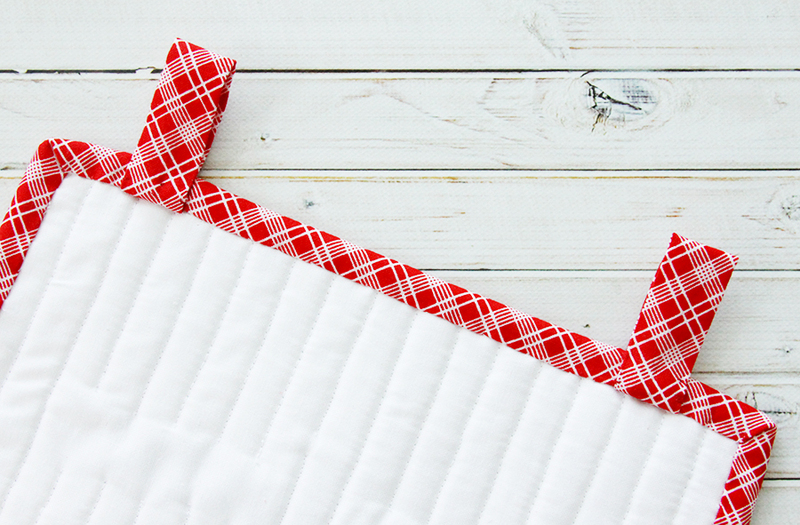 The Mini Quilt is the sweetest little banner shape and has two fabric strips for hanging it from a little dowel or strip of wood. The embroidered details add a fun texture and color too! 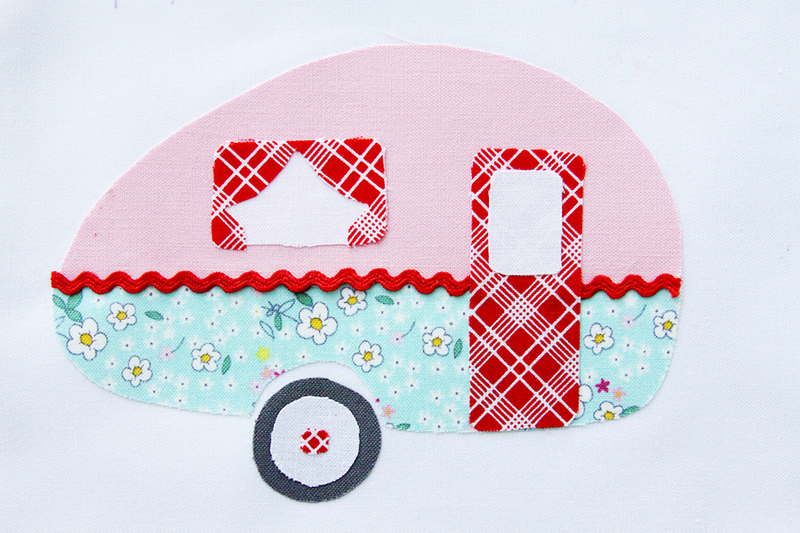 Print out your Camper pattern and Layout. Cut out the pattern pieces and cut out fabric pieces slightly larger than your patterns. Iron the HeatnBond Lite on the wrong side of the fabrics and cut out all the fabric pieces. Cut out from your white background fabric two pieces that are 9″ x 11″ and use the pattern layout page to cut the bottom of the pieces into a banner shape. 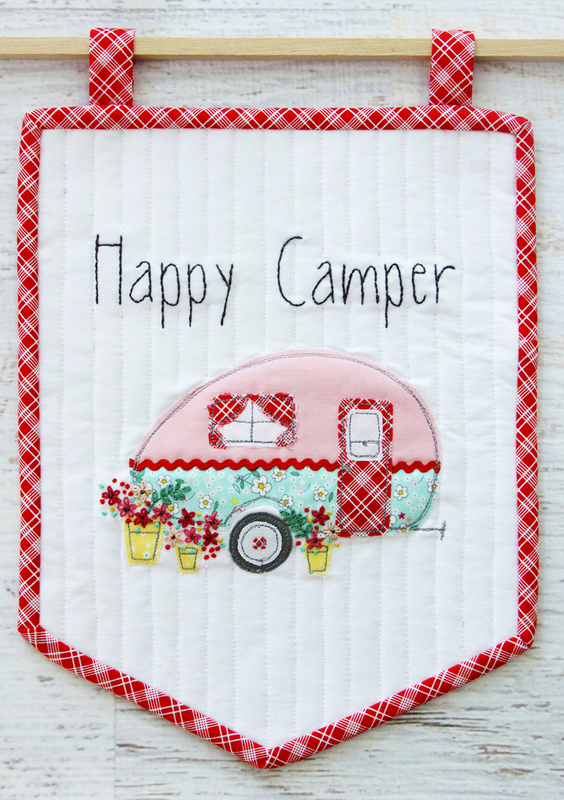 Using the layout as a placement guide, iron on your fabric camper pieces, except for the planters. Add the rick rack the length of the camper over the seam, but trim out the section under the door. Optional – glue the rick rack in place instead of stitching it on. Iron the fusible interfacing or embroidery stabilizer to the back of the front banner piece. Using a free motion foot on your sewing machine, stitch around the shapes two or three times. 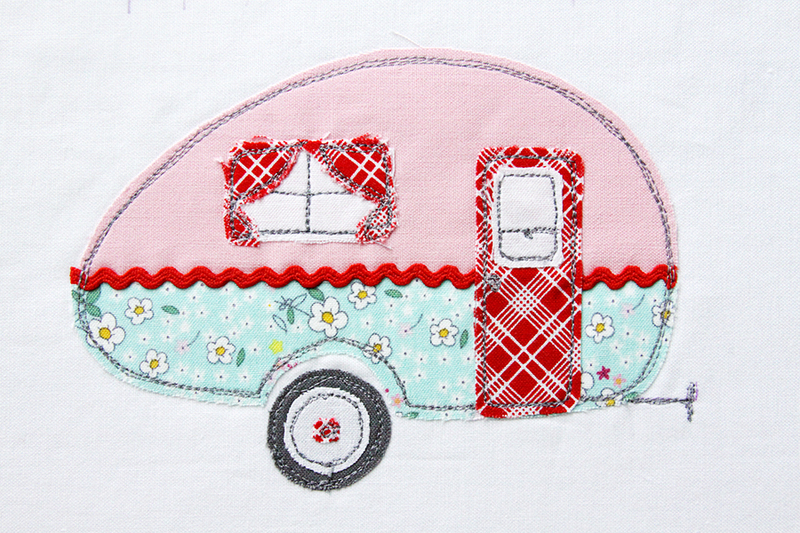 Add the extra details of the window panes, doorknob, and towing hitch with stitching. Iron on the planters and transfer all the embroidery designs. 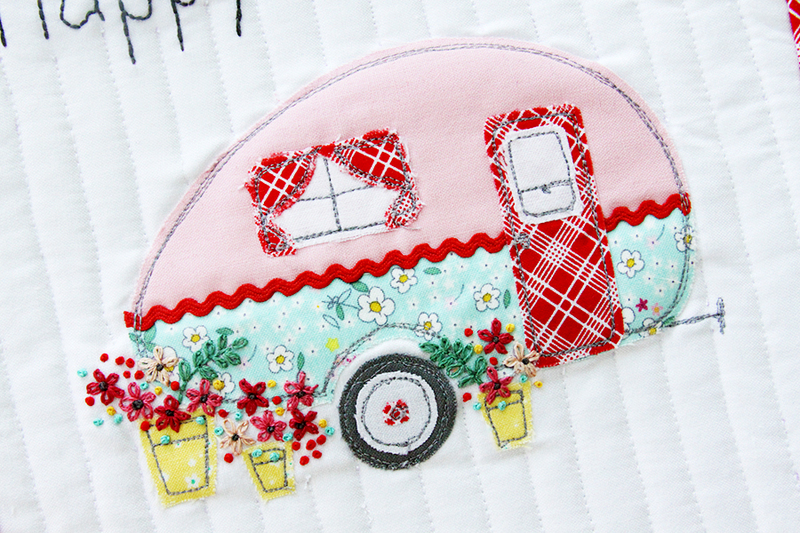 Stitch around the planters like you did with the camper. 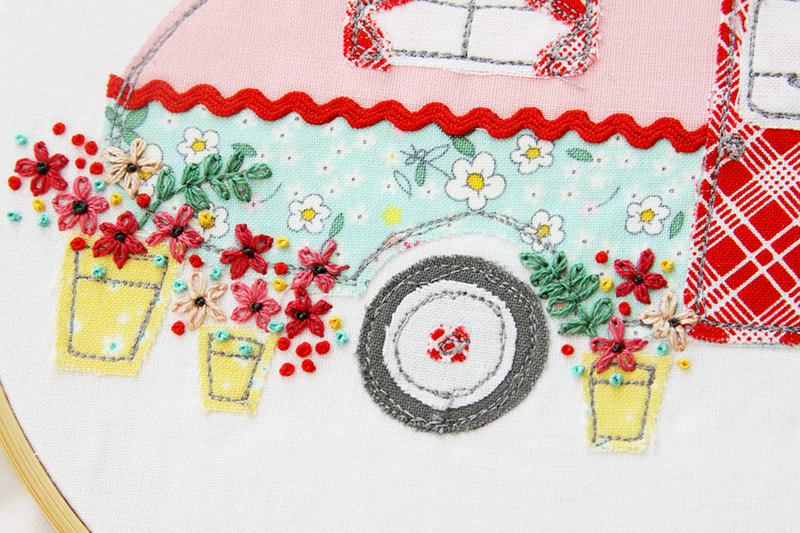 Embroidery the design by adding lazy daisy stitches for the flowers and French Knots around the flowers and Planters. Stitch the leaf stems with a back stitch and the leaves with small lazy daisy stitches. Embroider the lettering at the top of the banner with a back stitch. Use three strands of floss for all embroidery. Layer your banner front, batting (or fusible fleece) and banner back pieces together and baste. Quilt the banner as desired. I used Aurifil 50wt white in straight lines. Cut a strip of red plaid 2 1/4″ x 42″ for double fold binding. Sew the binding to the front of the quilt. 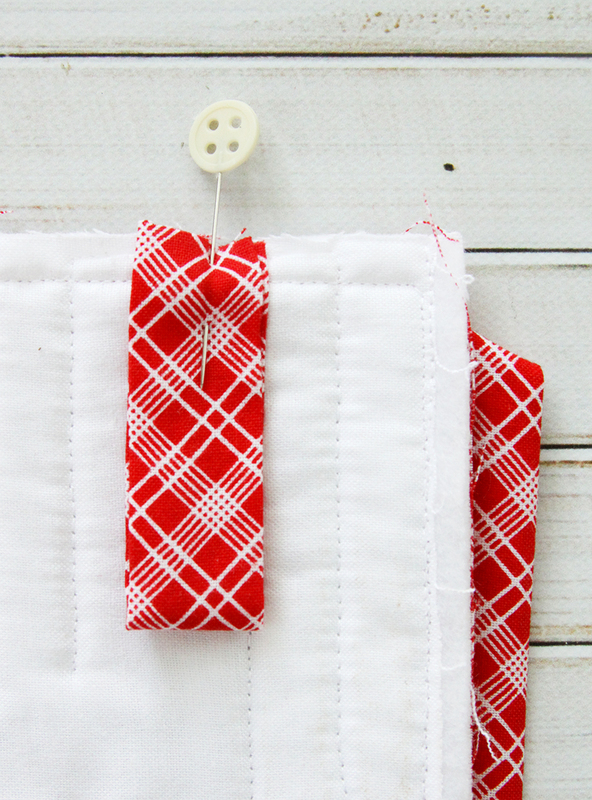 Cut a strip of red plaid 2″ x 9″. Sew into a tube, right sides together with a 1/4″ seam allowance. Turn right side out and press with the seam in the center. Cut the strip into two 4 1/2″ pieces. Fold each strip in half with the seam to the inside, and pin the raw edge towards the top of the banner on the back side, 1″ from each side. Sew the strips in place just inside the binding seam. Hand sew the binding to the back of the quilt. Once the binding is sewn in place, fold the hanging strips towards the top of the banner and hand sew in place. 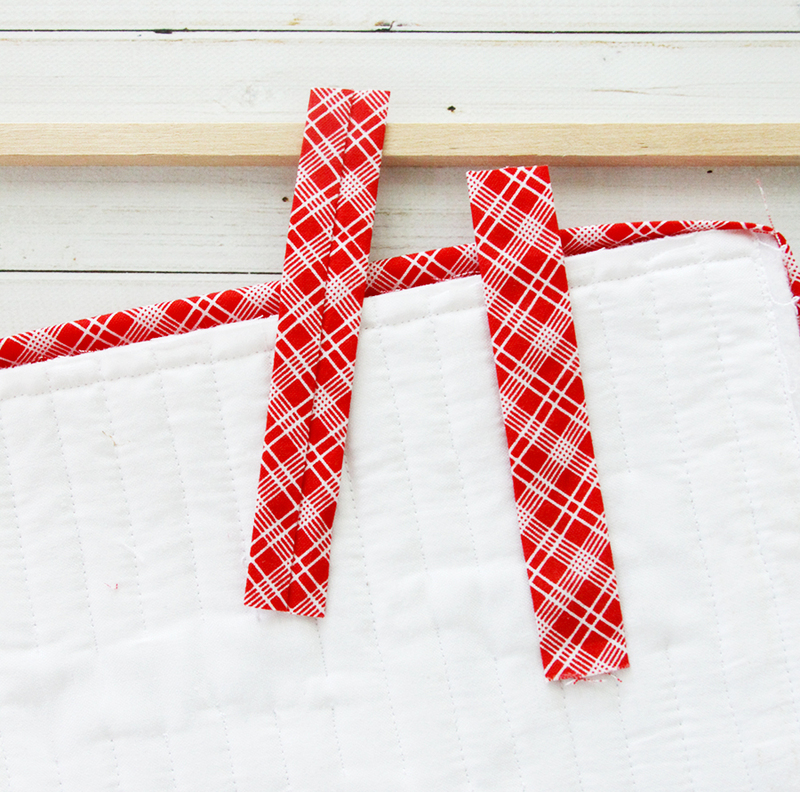 Hang the mini quilt from a cute wood dowel or even a little branch! We had so much fun with Bev’s Mini Quilted Banner project that we had to create some for ourselves/ Download the Missouri Star mini banner printables HERE!